Wasp is a blanket term referring to insects in the Hymenoptera order and Apocrita suborder, of which there are more than 100,000 species. In North America, wasp is used to describe members of the Vespidae family, including yellow jackets and hornets. 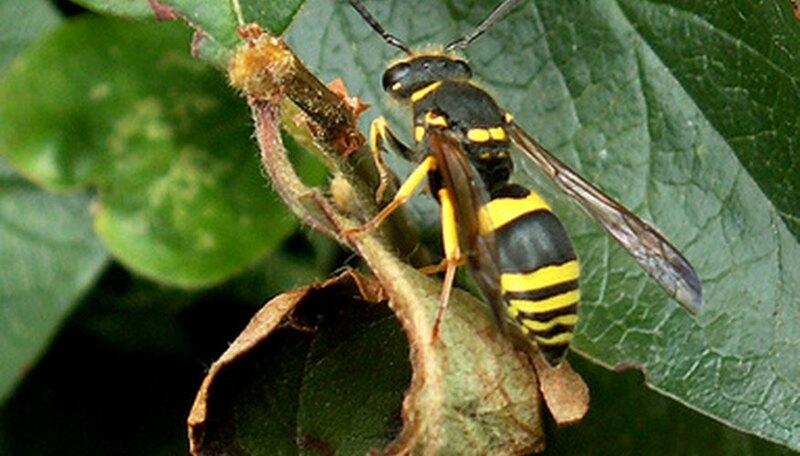 Yellow jackets are commonly regarded as common wasps, though a number of other North American wasps exist, including paper wasps, potter wasps, cuckoo wasps and mud daubers. A swarm is a group of insects moving in large numbers, and many species of insects are known to move in swarms. When wasps swarm, the situation can be dangerous because wasps are stinging insects that become aggressive very quickly. Unlike many bee species, most wasps are capable of stinging numerous times because their stinger is not barbed. A wasp or swarm of wasps that feels threatened will sting continuously until they feel safe again. Many wasp species swarm primarily to protect their nest. If wasps sense their nest is in jeopardy, they may swarm the area to fend off the perceived attacker. Wasps are known to swarm people and animals if their nest is disturbed. Although most wasp species, like yellow jackets, build their nests in the eaves of houses and in trees, some wasps build their nests in bushes or plants such as ivy, and so they can be disturbed much more easily and unintentionally, causing a swarm reaction. Wasps may also swarm when they are searching out a new nest location. This is not a threatening swarm, as they are simply moving in a group to locate the building site for their nest. If you disrupt a swarm of wasps looking for a nest, they may become aggressive. Many wasp species, such as paper wasps and mud daubers, can be aggressive any time they are away from a safe haven like their nest, and so you should avoid coming in contact with them. Social wasp species, like hornets, have a hierarchy system with a single queen, numerous male suitors and sterile female workers. The queen hornet is responsible for beginning the nest creation before the female workers step in to finish construction. During this process, the males and other female bees are extremely protective of their queen, and may become aggressive and swarm easily. Hornet nests are especially volatile during the beginning of their construction as the queen is likely to be vulnerable, and the other hornets in the nest will act accordingly. Some wasp species can be aggressive without provocation, and may swarm or attack for no perceived reason. Paper wasps, for example, are naturally aggressive wasps that may attack people or animals without any real provocation. Because flying wasps can be difficult to identify in motion, the best course of action is to distance yourself from a wasp as much as possible to avoid giving the insect a reason to sting. Uhl, Jennifer. "Why Do Wasps Swarm?" Sciencing, https://sciencing.com/do-wasps-swarm-6667768.html. 25 April 2017.